Bristol, Alexandria and Hebron - Towns and Newfound Pathways mark Shared Lane Use Markings on 7.4 miles of highway along the western shore of Newfound Lake. 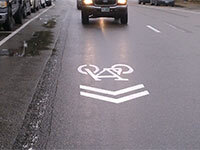 The markings indicate that the narrow pavement space must be shared, meaning simultaneous and separate operation of a motor vehicle and a bicycle is not possible within the lane. With generally a 10-foot paved travel lane and about a foot of paved shoulder space, motorists staying in the lane can not safely pass a bicycle operating along the highway. The pictures taken October 7, 2017 illustrate how Newfound Pathways volunteers and Town of Bristol police made the safety and access improvements possible. Durham: Sharrow on Main St.
doors without warning. The results of a "dooring" crash will be catastrophic. Watch the WMUR backstory of a dooring crash in Durham. "I AM TRAFFIC" hosts an interactive graphic that helps motorists and cyclists judge when a traffic lane can not simultaneously accommodate a motor vehicle and a bicycle. 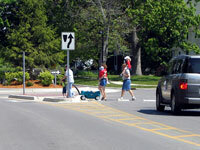 Bicyclists and motorists must use due care around pedestrians at all times (RSA 265:37). 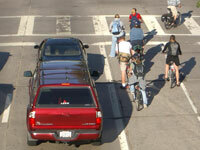 Bicyclists have the same rights and responsibilities as motorists. Bicycles are vehicles (RSA 265:143). 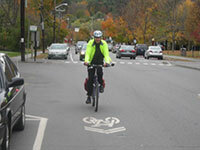 The safer lane position in general for a prudent bicyclist might surprise you. Avoid the "door" zone of parked cars, even when a bike lane is marked in this area. Take the full lane when your safety depends on it (RSA 265:144,XI(d)). Sharrows along NH 120 in Hanover. When overtaking and passing another bicycle or any other vehicle proceeding in the same direction. When preparing for or making a left turn at an intersection or into a driveway. When proceeding straight in a place where right turns are permitted. When necessary to avoid hazardous conditions, including, but not limited to, fixed or moving objects, vehicles, bicycles, pedestrians, animals, broken pavement, glass, sand, puddles, ice, or opening doors of parked vehicles. RSA 265:143a Requires Motorists to Exercise Due Care When Approaching a Bicycle. Leave a reasonable and prudent distance. That must be at least 3 feet when the passing vehicle is traveling at 30 miles per hour or less and one extra foot for every 10 MPH over 30 miles per hour. Other drivers - and even officers of the law - may not understand why you must claim the lane for your own safety. Remain respectful to all while advocating for your own safety and negotiating for the space that you require. A cyclist posted a video on Youtube showing this common misunderstanding with a bicyclists safety and operational requirements. Wear bright clothing. Reflective clothing is required at night (RSA 265:144,XII). Wearing a helmet can prevent a head injury. A helmet is required for those under 16 years of age (RSA 265:144,X). When passing another cyclist on the road, make your presence known by calling out "On your left" as you approach. Respect metal grid bridge deck surfaces, timber surfaces with longitudinal cracks and skewed RR crossings. Obey signs and rules of the road including the correct use of legal hand signals. If driving bicycles two or more abreast unnecessarily impedes the flow of traffic, drive your bicycle Single File (RSA 265:144,V). 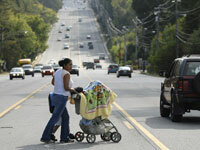 National Highway Traffic Safety Administration's Everyone is a Pedestrian website. New Hampshire Department of Transportation Driving Toward Zero program has set a goal of zero highway fatalities. The League of American Bicyclists recommends a specific goal of zero cyclist and pedestrian fatalities. Child pedestrians and child bicyclists are traffic too. Promote accountability and an evidence-based approach when referring to highway crashes. Editorial Patterns in Bicyclist and Pedestrian Crash Reporting: How news articles apportion blame in car/pedestrian and car/bicycle crashes. Move over and slow down for state and local police officers, tow truck drivers, maintenance personnel and EMTs too. Safely navigating around all pedestrians is no accident. As this 30-second video from the NH Department of Safety explains, it's the law. 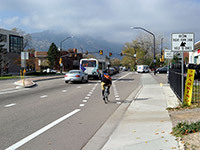 In addition to installing various MUTCD signing and pavement marking modifications desired by municipalities, Traffic Bureau may install and maintain certain limited types of bicycle signing. 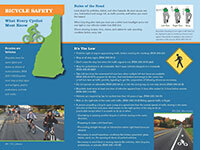 Anyone wishing to bring specific traffic concerns relative to bicycling to the attention of the NHDOT can make an inquiry to NHDOT to approve and install these limited bicycle signing themes as described in the NHDOT Guideline for Bicycle Warning Signs. A bicycle is a vehicle and it belongs on the highway - not the sidewalk or the ditch. This video shows cyclists safely operating under traffic conditions that are as challenging as any that you will face anywhere. 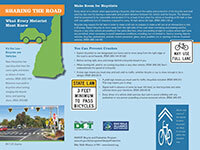 The Federal Highway Administration has developed safety training materials for children: Bicycle Safer Journey and Pedestrian Safer Journey. BWANH recommends "Be a Safe Walker" and "Be a Safe Bike Driver" for children.